Philadelphia Wizard World ComicCon! It was, I dare say, a hoot! Check out this girl as classic ROMANA! She was a sweetie, and nailed the look and attitude! There was a big Whovian photo blitz at 1 pm, and they kept calling for group shots, and at one point they yelled: "OK, we want CLASSIC Who. Classic Who characters only in front of the TARDIS." And she and I were the ONLY TWO that walked up! There was a 4th and a 5th Doc wandering around (plus K-9, as you see above) but they weren't there for the big photo thingy. There were several Martha Jones's there, but this lady was spot-on! All in all, I don't think I've been photographed this much since my wedding oh-so-many years ago... It was fantastic, brilliant, and overall wonderful! Allons-Y and Geronimo!!! 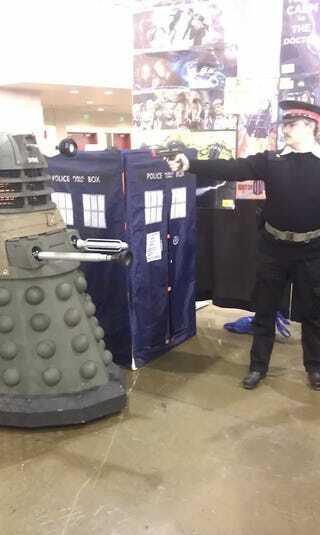 UPDATE: rather than start anew post, I'll just add on to this as new stuff appears: nice vid fromt he whole Con, including the Whovian photo session with me and lots of others! I'm in a wee bit of video from Comic Con! look for me at 1:46! Still on a 'high' from the great day yesterday!